Render beautiful slideshows packaged in a single self-contained movie file. Automatically generates a Web page embedding your SlideshowMovie ready for publishing. 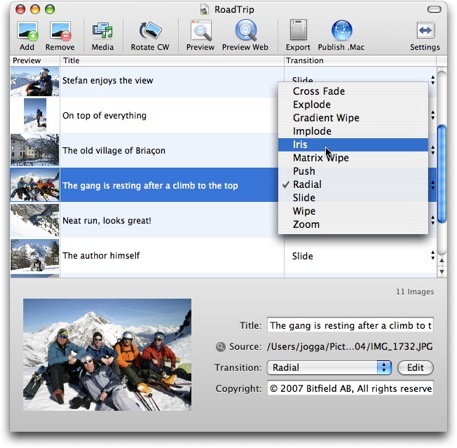 Choose from hundreds of combinations of real-time transitions between images. Add subtle and beautiful slideshow controller buttons. Watermark and protect your images with copyright text of your choice. [BUGFIX] Fixed a bug where audio would disappear using QuickTime 7.5.